Rockledge Gardens was the perfect venue for me and my husband to get married! Our wedding was in early March and all the flowers were blooming, it was gorgeous. There are a hundred beautiful backdrops for photos. When the sun went down, the string lights came on and the fire started and it just turns the whole venue into a magical place. All of our guests commented on how beautiful it was. The staff is continuously improving and beautifying the venue. Liz was great to work with and Jessica helped me so much on the day-of with last minute decisions and helping me with my dress. Thank you to all the staff, we had a wonderful day. Thank you so much, Jen! You and Eric were absolutely a pleasure to work with and we wish you so much happiness in your marriage! My husband and I were married there on March 1st and we could not have asked for a more beautiful location. Liz was with me every step of the way made the whole process completely stress free. Jessica came in the day of and along with the other amazing event staff they made our day perfect. If you are looking for a one of a kind amazing wedding venue come here! Thank you so much, Deanna! You created so many beautiful touches and we loved working with you! Wishing you and Matt a million years of happiness! Absoultely gorgeous venue and outstanding staff to assist! My husband and I got married at Rockledge Gardens in February and we had the best time! The venue is absolutely beautiful. I love how everything is all right next to each other (ceremony space and reception/cocktail space). I highly recommend getting a food truck for cocktail hour and dinner, people LOVED it. The lights at night make this place truly magical and we are so thrilled we chose this place. Planning with Liz and Jessica was a breeze, highly recommend for your wedding! Thank you so much, Michelle! 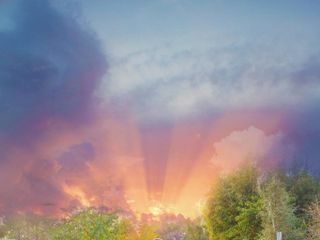 That photo is pure magic! We'd love to see the rest from your wedding! Wishing you two a lifetime of happiness, laughter, and joy in marriage. I really wanted to have an outside wedding that wasn't too expensive. This really was the perfect place! Many of the vendors had already worked there so they knew each other, the flowers were all beautiful and they helped us each step of the way. I can't imagine a better venue! I highly recommend it. PS splurge a little for the horse drawn carriage! Thank you so much, Lonna! We loved working with you guys! And Ryan in the top hat was the best ever! 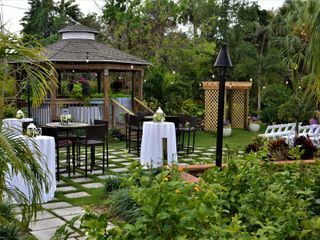 We love the feel of a backyard wedding that Rockledge Gardens has! The staff is amazing and will work with you every step of the way. They are very flexible about vendors and so much is included in the package that it's extremely affordable. Would 100% still book here if I did it all over again. There are so many beautiful features all over the place and the relaxed vibe of the venue makes for a beautiful wedding. Thank you so much Samantha! And thank you for the feedback. We’ll work on making sure there is someone to run interference during first look, etc.! A Dream Come True Venue! 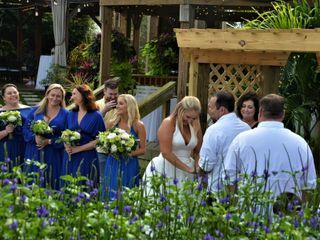 From our first tour, into our planning, and throughout our wedding – our experience with Rockledge Gardens, Liz, and her staff was pleasant, professional, and straightforward! I would recommend this venue to anyone and everyone! Liz has outstanding communication, organization skills, and planning techniques that gave us much needed comfort as we planned our special day. In many ways, she went above and beyond to make sure our wedding day was everything we hoped it would be – and it truly was! The venue itself is AMAZING! The venue is well kept, GORGEOUS, and extremely functional and convenient! There honestly is not one thing I would have changed with our Rockledge Garden experience! Thank you SO MUCH, Brooke! You were truly a delight to work with from start to finish as well! We're so happy you and Justin chose to start your forever with us! Rockledge Gardens was such a beautiful place to have our wedding! The evening was fantastic and Liz does such a great job coordinating and helping you through the process. I highly recommend this venue!! Thank you so much, Misty! You were so beautiful and lovely! We know you and Arlee will be so very happy! I could not have imagined a more perfect venue for our wedding than Rockledge Gardens. 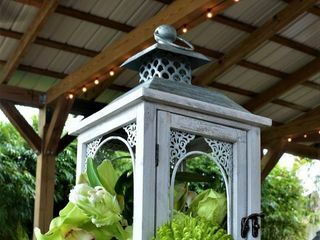 Firstly, the venue itself is beautiful, especially when coupled with the optional pavilion interior plant decor service. We were blown away on our wedding day. Also, Liz and her entire staff were more than accommodating and always striving to help make our day as amazing as possible. We were even able to include our pup in our day! We were thrilled with the entire process of planning our wedding at Rockledge Gardens, especially on our wedding day. We truly couldn't have asked for a better experience. I have and do recommend Rockledge Gardens Weddings to anyone who will listen. Thank you so much, Ryan! 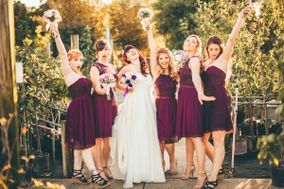 You guys we so great to work with and Emily's wedding gown was just the loveliest things we've ever seen! Wishing you so much happiness! Rockledge Gardens was the PERFECT venue for our wedding! Every detail was perfect! When we found Rockledge we had no idea how truly amazing this place was. 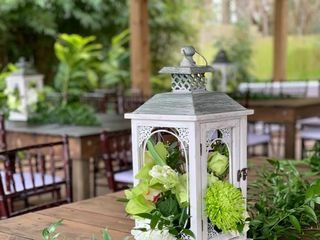 The venue is gorgeous; full of places to explore, natural beauty to enhance the mood, and cozy to keep you close to all those attending your special day! Our guests were raving about how spectacular Rockledge was! The staff is so professional and personable! They were prepared for everything and kept me and my husband calm through out the entire planning process and the day of! They were so easy to contact. At any moment I was able to get an answer to a question or concern. There were no unpleasant surprises. Our centerpieces were made at the venue as well and everyone loved them! Our day was perfect at Rockledge Gardens and if we had to do it all over, we would be doing it there again! Thank you to Liz and her wonderful staff at Rockledge for making our day perfect! Thank you so much, Jessica! We LOVED working with you and Bradlee and we will never forget your amazing blue shoes! My then fiance and I went to see a hall for our first tour of venues. It wasnt what either of us wanted and was almost our entire budget. Then we visited Rockledge Gardens. In awe from the first sight and as the tour went on we knew it was it. The gardens are gorgeous. The pavillion can be anything you make it. Plenty of places to take gorgeous pictures. The staff was so nice and accomodating. We had a smores table at the firepit and it was a smash with the kids and adults. I cant say enough of Rockledge Gardens. I pestered with a million questions as we approached the day and pestered more the week of. They were very patient and caring. The cost was affordable and it was all a dream. Thank you so much, Lupe! I loved all your touches, especially the unbelievably adorable ring bearer! We wish you and Godfrey so much happiness! Thank you so much, Sarah! You have an absolutely beautiful family and we wish you and George a lifetime of happiness filled with bliss and fun! I wish I could give Rockledge Gardens 100 stars! Liz and her team made our planning stress-free and so easy! They recommended some amazing vendors for us, and they all worked together to make our day perfect! The team helped with day of the wedding coordination also, which was amazing. I cannot stress enough how seamless the wedding planning and event day went, and not to mention the gardens are gorgeous. The setting has something for every style of bride and our photos are gorgeous. If I ever have another wedding, I would seriously do it at Rockledge Gardens again. Best experience ever!!!!!! Thank you so much, Jayme! You were our first destination bride and we are so happy we could help you plan from afar! Wishing you and Justin and incredible life full of joy and laughter! We had our wedding on March 24th and it was absolutely perfect! The venue was beautiful and everything was handled very professionally. Liz was fantastic and never tired of my endless questions. She made sure all went smoothly and was very helpful. We could not have asked for a better experience! Thank you so much, Diane! We loved all your beautiful touches. Wishing you and Buddy a lifetime of joy and happiness! The Rockledge Gardens wedding space is such a hidden gem! Every inch of the property is so beautiful and was perfect for us on our special day! The staff was more than accommodating through the entire planning process and they were all so sweet. I would do it all over again in a heart beat! Thank you so much, Lisa! You were simply wonderful to work with and we LOVED your handmade touches. You are talented, beautiful, kind, the complete package! We wish you and Thomas incredible happiness in your marriage! We couldn’t have been happier having our wedding at Rockledge Gardens. The venue was perfect for our outdoor country themed wedding. It’s such a beautiful place. Thank you so much, Nancy! We loved all your touches, especially the cake with your initials carved like a tree trunk! We wish you and Kevin a lifetime of happiness! Liz, in particular, was such a joy to work with. She's extremely responsive and goes above and beyond for her couples. We are so, so happy we chose Rockledge Gardens as our wedding venue! Thank you so much, Nicki! You were fantastic to work with. We wish you so much happiness! We had our intimate wedding here. It’s the perfect place for a ceremony. The garden creates a wonderful place for such a special day. The reception is right next to the ceremony so it’s very beneficial. I love the lights and the little tiles area; made night time so beautiful. Thank you so much, Tricia! You and Marion and your two little girls are such a sweet family! We are so happy that you chose to celebrate with us! My husband and I tied the knot at Rockledge Gardens in November and it was a genuine dream come true! The space is absolutely divine and the staff is incredible. We found out about this wonderfully vibrant and inviting venue at a bridal show after speaking with Liz. From that moment forward she was instrumental in helping us achieve our perfect day. Through her partnership with Rent Your Events we were able to secure tables, seating, and linens which made planning tremendously more easy. She also helped us find affordable special event insurance which gave us peace of mind so that we could relax and enjoy our celebration. Her support and involvement throughout the whole process was superb. With respect to the space, in a word, the grounds were enchanting. Our wedding felt truly surreal and our guests were in awe of the striking beauty at every turn. 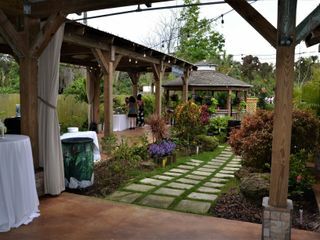 For our intimate gathering of about 40 guests, the layout of the grounds played a huge role in the success of our evening. After having our ceremony under the archway on the lawn, our guests were able to be seated immediately for the reception in the pavilion. Having the kitchen and bar space made things seamless for our caterers. One of my favorite things, though, was having the fire pit. Before our wedding I had admired pictures of other couples' at the Gardens and was always impressed to see how different each appeared. The space is so well designed; it truly becomes the canvas for any couple's theme. Shout out: All photos of our event featured with this post were taken by Oak& Iron Photography. We had our October wedding here and we could have not chosen a better venue! Great staff and great space, and Elizabeth is absolutely fantastic!! Our wedding planner cancelled last minute and Elizabether and her team really made sure our day went according to plan. Rockledge Gardens made our day so special!! Abby you were a delight! We will never forget the bride on the Lyra! Liz and her staff at the garden made us feel like part of the family. The venue is amazing, with the whole garden at your dispossal for pictures before or after the ceremony. The covered pavillion was perfect for the caterer to set up and serve. The gazebo was perfect for the band that we had. After the sun set, the provided lighting transformed the space into a magical spot. We could not have asked for more. Thank you so much, Jeff! You and Tiffany are such a beautiful couple. We are so thrilled that you started your marriage here! Ours was an LGBTQ wedding. You could not ask for a more open hearted and inviting staff than those at Rockledge Gardens. 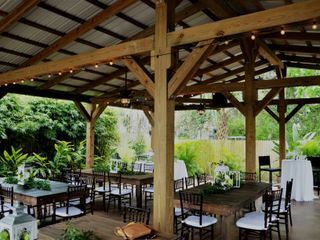 On top of the 100% support they have for all couples, that immediately set our minds at ease, "The Harry and Mary Witte Learning Center" pavilion where they host events is one of the most beautiful settings for a wedding that you can find in Brevard County. It was such a magical night that we are thinking of booking our One Year Anniversary party at the same location. Thank you so much, Ben! We are so honored that you and Dwight chose to celebrate your marriage with us! Can't wait for the anniversary party! Saying our vows in front of our loved ones couldn't have been in a better setting. It was so beautiful and all our guests commented on how nice it was. This venue was a hidden gem. Everyone that works here went out of their way to make sure my day was special. There is so much beauty in nature and it was my "secret garden" that couldn't have been more perfect. Thank you so much, Maria! We'll never forget your amazing wedding gown! You were such stunning bride! I got married here back in 2011 before they had the new pavilion. I love being surrounded by so many gorgeous tropical plants! It was so romantic, dreamy, and magical! And we saved a fortune on flowers because it's already naturally beautiful! Great alternative for outdoor ceremony. The greenhouse is an option in case of rain and they bring any of their inventory into the greenhouse to decorate.